I discovered I had issues with gluten and wheat about 3 years ago. Being a massive fan of eating out and someone who really enjoys food, I have since made it my mission to find out where the best places to eat in London are if you are Coeliac. I'll also put up my favourite recipes and other good websites/blogs that I like. All I can guarantee is that there's no gluten here. This is a gluten-free zone. Down with gluten. 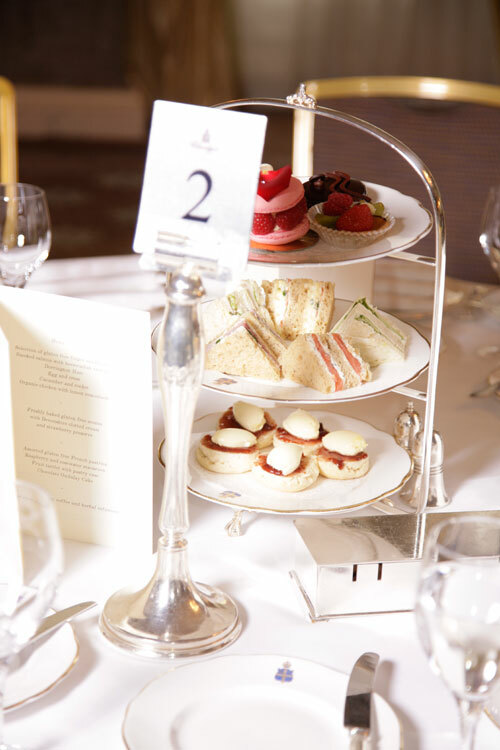 Thanks to the lovely people at Mission Media, I was invited to the Genius gluten-free tea at Claridge's last week. It was the start of a genius friendship between, erm, Genius and Claridge's - who will now offer a gluten-free tea, similar to the Ritz (see previous post). In my humble opinion, Genius bread is the best g-f bread available, and it lent itself amazingly well to crustless, triangle sandwiches with delicious fillings - anyone who didn't know would have struggled to identify the fact that they were sans gluten. 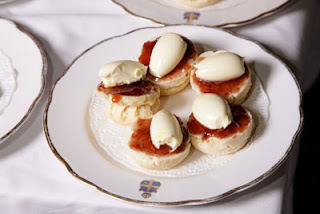 As the harpist serenaded us, and champagne glasses clinked, we were brought more and more sandwiches, and then, joy of all joys - GLUTEN-FREE SCONES with cream and jam! This was something I seriously missed at the g-f Ritz tea and these were small but perfectly formed mouthfuls of pure heaven. Lucinda Bruce-Gardyne, the creator of Genius products, is a michelin-starred chef and has spent years developing her g-f recipes. Her passion for creating great g-f food really comes through in the flavours and textures of her products and these scones were no exception! Such a treat. We also scoffed Claridge's desserts that were naturally g-f - raspberry macaroons and gorgeously rich chocolate mousse-cake but nothing triumphed the fact that here we all were, eating gluten-free tea - with finger sandwiches and scones - just like the rest of the gluten-eating world. Genius. There was a great speech by Lucinda herself, who just proved what a lovely, down-to-earth person she was, and her dedication to the g-f cause is something we should all be very thankful for. With more people like her pushing great g-f products to supermarkets etc, hopefully they will respond by stepping up their game, meaning that g-f products just keep improving! Yay! So just a quick update (and an apology that it's been so long...) - just had an email from Sainsbury's promoting their all-new and improved Free From range. Some of it's on offer at 50% off and even the stuff that isn't looks worth trying out! I though the new 'granola-style' cereal looked good - and no nasties in it either - all natural, good stuff - YUM! Please post a comment if you try any of the new stuff and let us all know what it's like, and I'll do the same. Having just raved about Mrs Crimble's new fresh g-f loaf, I didn't think I would find anything better - at least not for a while... However, I think I have! It's a new product called Genius bread and is made by a mum who has children with allergies (according to the website, anyway!). It's only available in Tesco at the moment I think but it's well worth taking a trip to one to find it. They seem to do a brown and white loaf - I've only tried the brown so far but it's soft, squidgy and absolutely delicious - I made a PROPER sandwich to take to work for lunch last week and it was still soft and fresh after a morning in my bag - YAY! Marks & Spencer have started doing a g-f chocolate muffin in their in-store cafes - yay! It's very chocolatey but very light... slightly crumbly but I am absolutely not complaining - to be able to get something properly g-f in a cafe so you can join in with whoever you're with is the all important thing! They're individually wrapped so no worries about contamination either - woohoo! Mrs Crimble has brought out a new loaf of g-f 'fresh' bread - and it's AMAZING!! Able to be eaten without being toasted (for the first couple of days) and it's ALMOST like that spongy texture of fresh normal bread from the pre g-f days... especially good with lots of butter and strawberry jam...! It's dusted with g-f flour and has a lovely farmhouse feel... It's great toasted too. I've only found it in Sainsbury's so far but it's WELL worth getting hold of some - let me know if you find it anywhere else! Konditor do new g-f brownies! Konditor & Cook have started doing an AMAZING gluten-free brownie! It's seriously rich, got black cherries in and white chocolate stripes on the top - UBERly good! They're my new favourite - WIN! I recently tried a couple of boxes from Graze. Although they don't yet cater specifically for Coeliacs, this is something they are planning to do in the future. However, you can see a list of all the ingredients by clicking on each product and you can easily fill your boxes with g-f stuff. There are only a few no-nos - mostly the chili-flavoured nuts. You can get fresh fruit, dried fruit and loads of different nuts and seeds etc - and delivery is included in the cost - to anywhere in London. Lots of fun when it arrives as the packaging is really lovely (and all recyclable) and the combinations of nuts/fruits etc are really imaginative and delicious. When I emailed them to ask about allergy-friendly foods, I got a really lengthy and detailed email in return.